The Korg KOPro Kaossilator Pro Plus Dynamic Phrase Synthesizer lets you perform and create multi-layered music in any style -- with just the touch of a finger. The Kaossilator series was the forerunner of unique instruments that made it easy for anyone to play musical melodies and phrases. 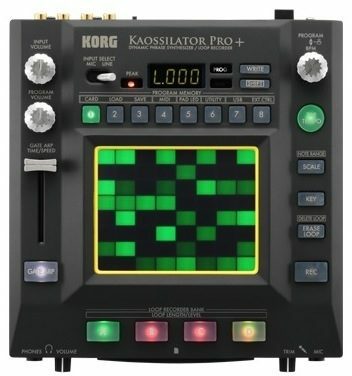 The Kaossilator Pro, which appeared in 2010, was a highly-evolved model featuring a rich variety of sounds and loop recording functionality that made it not merely a live performance instrument, but also a track-making tool. With additional sound programs and drum sounds Kaossilator Pro+ has been supercharged to offer even more variety and exploration. 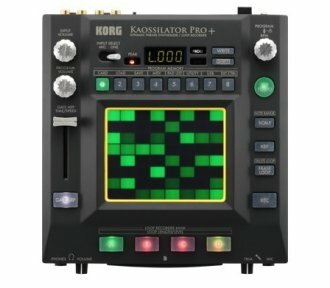 With just a single Kaossilator Pro+ you can perform hip-hop, chiptune, house, dubstep, disco, electro, reggaeton, and drum 'n' bass...or create your own genre! Even if you've never played a musical instrument, the Kaossilator Pro+'s Key and Scale features ensure that the notes being played will match the song being performed. Use the Key setting to specify the musical key or root. Choose any of 35 scales, ranging from popular scales such as chromatic, major pentatonic, and minor blues, as well as unusual scales such as Spanish, Ryukyu, and Raga. By using both the Key and Scale settings to match the song, you can play perfect solos without a single wrong note. In addition, the Note Range allows you to specify the range of playable pitches. You can set this to a narrow range to ensure that melodies will be played accurately as you intend, or to an extremely wide range to allow unexpectedly dynamic and unconventional phrases to emerge. * Interoperability will be enabled by a system update for the kaossilator 2.